The Intel® PRO/100 S Desktop Adapter represents the next generation of Fast Ethernet desktop connections. Maintain high performance on managed PC networks while offering accelerated LAN security to preserve performance on IPSec-enabled networks. The Intel PRO/100 S Desktop Adapter is designed for Windows* 2000 networks running IPSec, but is flexible enough to run ...in Windows 98 and Windows NT* environments using Intel® Packet Protect II software. The Intel PRO/100 Desktop Adapter is a member of the industry’s first complete family of security adapters that protect data for all of your systems without sacrificing performance – mobile, server, and desktop. 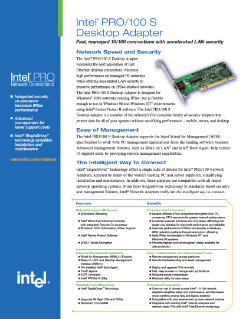 The Intel PRO/100 S Desktop Adapter supports the latest Wired for Management (WfM) specification to work with PC management applications from the leading software vendors. Advanced management features, such as Wake on LAN* and Intel® Boot Agent, help reduce IT support costs by providing remote management capabilities. Intel® SingleDriver™ technology offers a single suite of drivers for Intel® PRO/100 Adapters, adopted by many of the world’s leading PC and server suppliers, simplifying installation and maintenance. In addition, these adapters are compatible with all major network operating systems. From Intel SingleDriver technology to standards-based security and management features, Intel® Network Adapters really are the intelligent way to connect. Read the full Intel® PRO/100 S Desktop Adapter Product Brief.